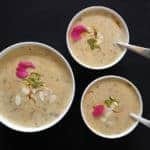 Sheer Khurma which literally means “milk with dates” in Persian, is a vermicelli pudding prepared during the holy month of Ramadan or on the last day which is celebrated as Eid by Muslims around the world. Traditionally made from dried dates this special dish is served as breakfast on the morning of Eid after the prayer, and throughout the day to all the visiting guests. 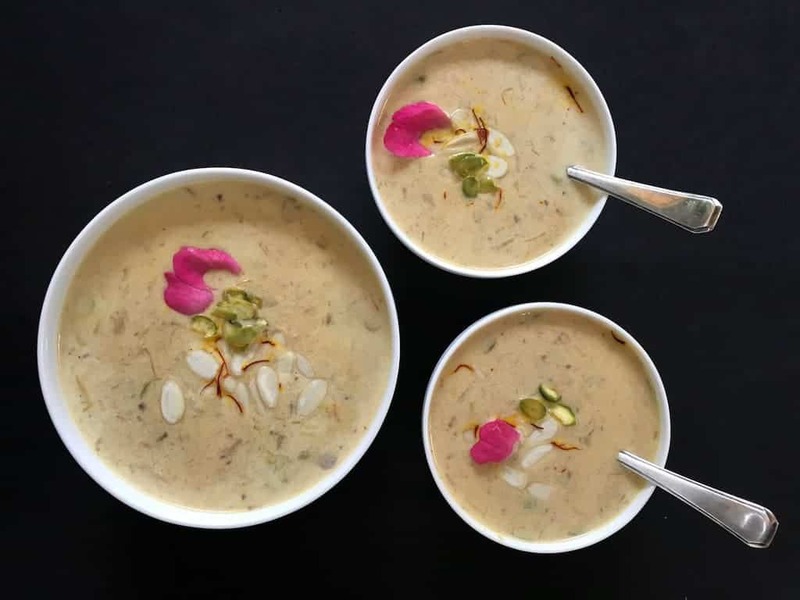 I have vivid memories of enjoying this irresistible dessert growing up in India; with its perfect bite from the assortment of crunchy nuts and poppy seeds, hint of sweetness from succulent dates and raisins, royal looks and the delicate aroma from saffron and homemade ghee; making Sheer Khurma such a heavenly treat! 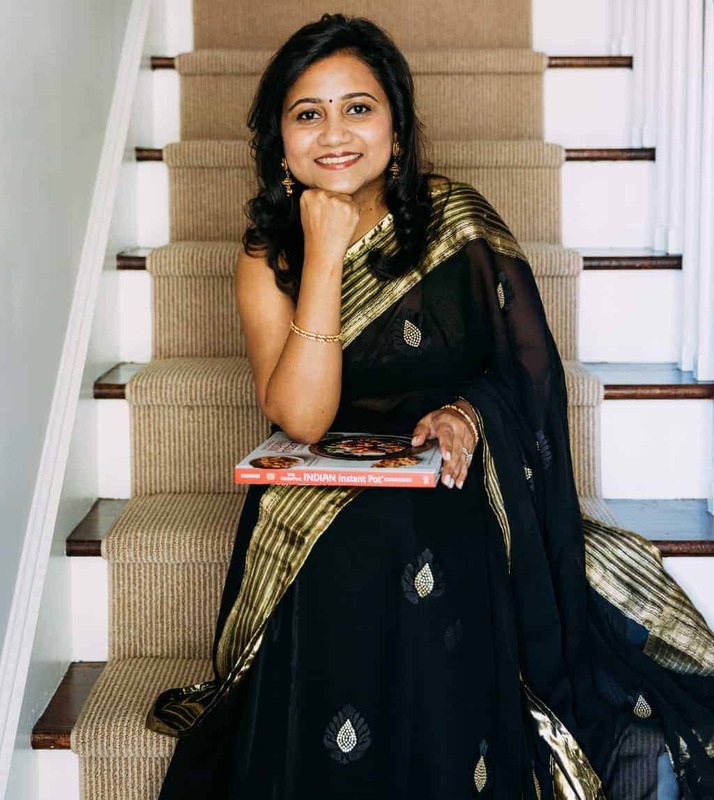 I grew up in a small, yet close-knit town in India. My Dad has a huge social circle and many of his friends who celebrate Ramadan, fast from morning until sunset during this holy month. The last day which is Eid or as I remember calling it “Ramazan Eid” is a big celebration involving family, friends and the community. 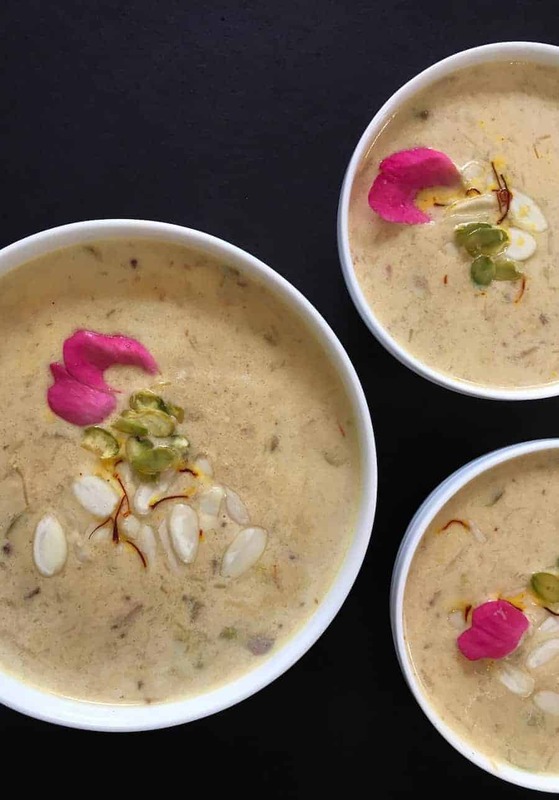 We would be invited over to celebrate and were offered many exquisite foods, one of which is this ambrosial dessert “Sheer Khurma”! Here is a nice article from national geographic on how Ramadan is celebrated Around the World. To all our Muslim friends, we wish you “Happy Ramadan and EID MUBARAK!”. 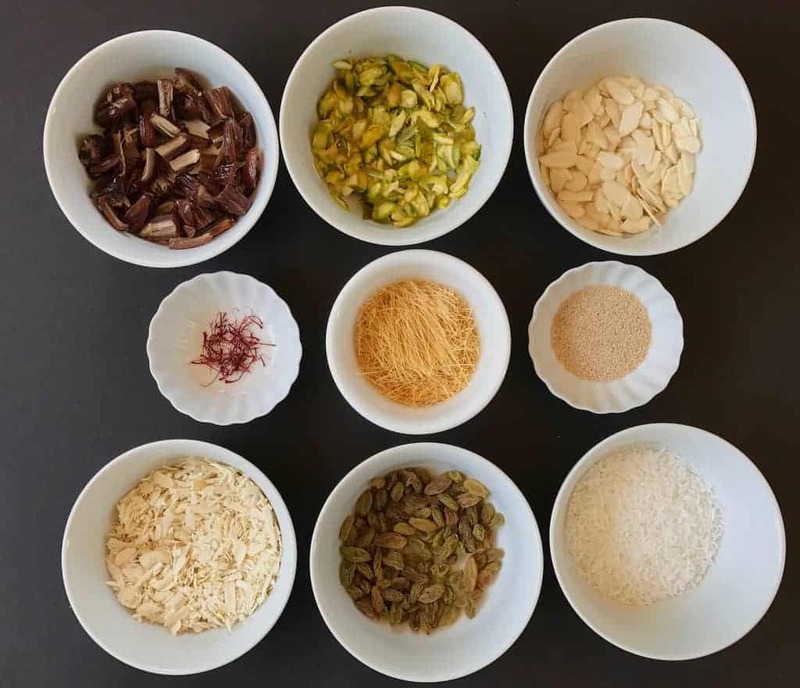 Check out some more of our easy Ramadan recipes – Chicken Biryani, Vegetable Biryani, and Masoor Khichdi. 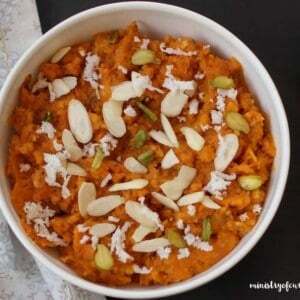 A Ramadan special dessert made with ghee, milk, dates, assorted nuts, vermicelli, poppy seeds and saffron! Soak Pistachios in warm water for 5 mins. Remove the skin and slice thin. Slice cashews and dates. 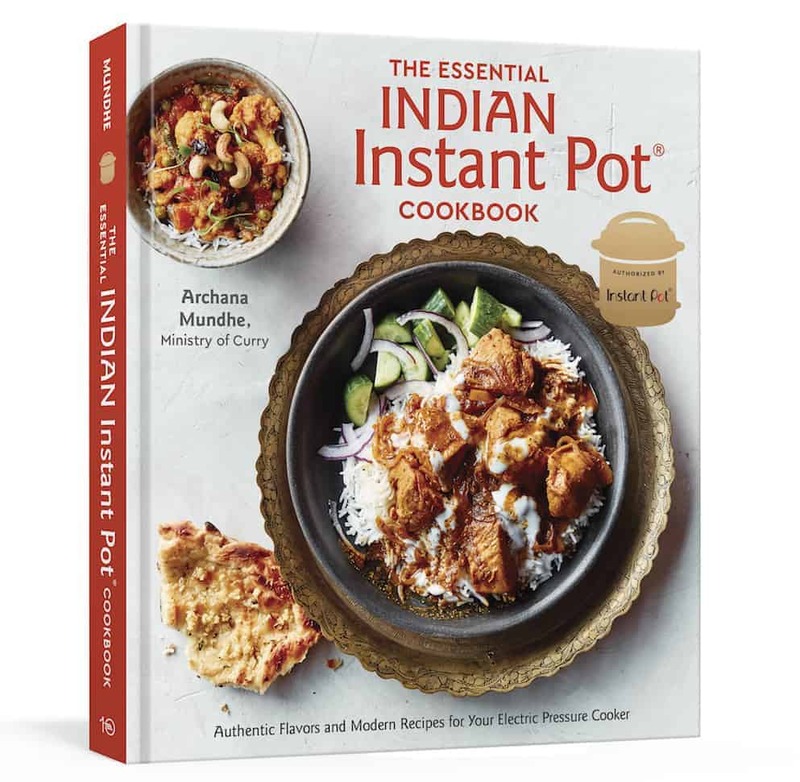 Turn Instant Pot to Saute Mode. Once the ‘hot’ sign displays add ghee. Add almonds, pistachios, cashews, and dates. Roast for a minute. Add raisins, vermicelli, coconut and poppy seeds. Mix well. Add 3 cups of milk, sugar, and saffron. 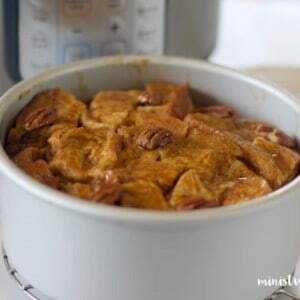 Give a quick stir and close Instant Pot with the pressure valve to sealing. Cook on Manual(Hi) for 2 minutes. Allow the pressure to release naturally. 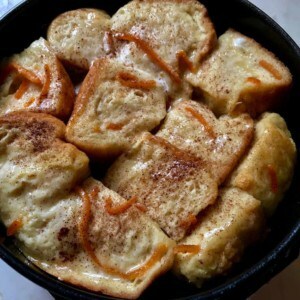 Open Instant Pot and add 1-2 cups of milk and vanilla. 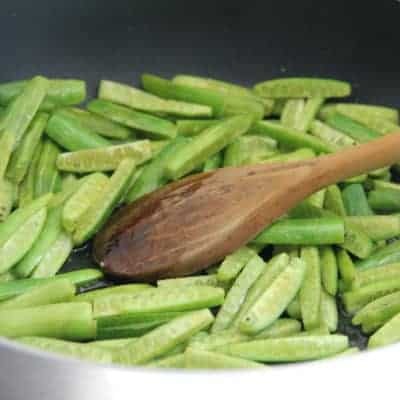 Set Instant Pot to sauté mode and bring to gentle boil, stirring frequently. Enjoy Sheer Khurma hot or chilled. 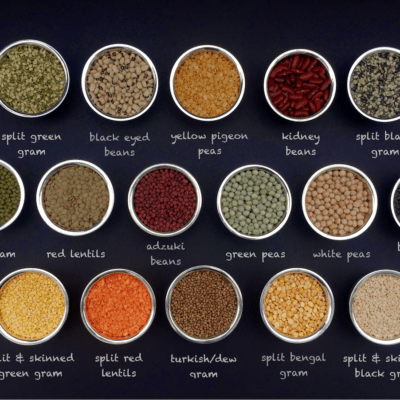 Are you using the cup that came with the instant pot? So the milk “broke” forming paneer like pieces or in other words its a disaster when I made it. What went wrong do you think? If the pot is not clean or if the milk is old it will curdle upon heating.